AdoptSMT distributes the whole Count on Tools product range in any country in Europe. FCM, 30, 50, 60, 70, 200, 300 Series. CP, IP3, QP, XP, NXT/AIM and GL. 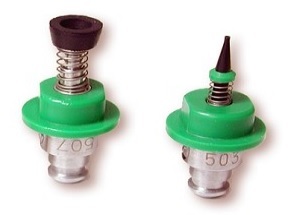 Other Nozzles, e.g. Amistar, ASM/Siemens, Camalot, Hitachi, Ipulse, Mirae, Panasonic, Quad/PPM, Samsung and Selective Soldering. Fully customizable widths & pitch based on process requirements. Compatible with both paper and emboss tape, simultaneously. Load up to 8 different parts on a single feeder tray. Absolutely non-violent for fragile components or loose packaging. Re-usable adhesive layer secures the tape to the plate for increased accuracy. Perfect for low volume, high mix applications and prototyping. Compatible with any SMT Pick-and-Place equipment or JEDEC-style Tray Feeder. Quick to assemble & install in your machine with fiducial markers for alignment. Fast changeover between product runs without unloading from the machine. Save thousands of dollars over customized feeders. 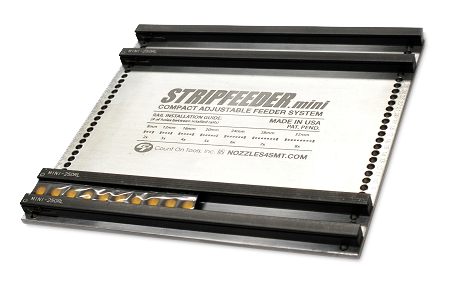 The StripFeeder Mini System features the same award-winning design of the original StripFeeder in a smaller, compact package (134 mm x 152 mm). This package is ideally suited for smaller prototype and rework machines as well as most SMT pick-and-place equipment.The new StripFeeder Mini System is a cost effective way to load many components, including odd-form and custom components, without having to purchase expensive feeders. The quick-to-assemble, easy-to-install modules are designed for rapid loading of tape-and-reel components on existing SMT pick-and-place equipment. Why purchase expensive feeders for each component or a small strip of tape when you only need to place a few at a time? The new StripFeeder .mod (Modular) System Version 2 are a cost effective way to load many components, including odd-form and custom components, without having to purchase expensive feeders. The quick-to-assemble, easy-to-install modules are designed for rapid loading of tape-and-reel components on existing SMT pick-and-place equipment. Why purchase expensive feeders for each component or a small strip of tape when you only need to place a few at a time?The StripFeeder .mod (Modular) System Version 2 now features a mechanical lock-spring to hold the tape in place by the sprocket hole for part registration and repeatable pick-and-place applications. This means you only have to teach the pick-up location one time and you can consistently reload the unit with the same parts over and over for longer runs. This feature is compatible with both paper and emboss tapes. Do you have a unique component that isn’t available in tape and reel?Tired of hand placing those components because you don’t have a compatible feeder?Can’t find JEDEC trays for your components and you need one yesterday? The answer to all of these questions is QWIKTRAY. The QWIKTRAY program provides quick turnaround on the design and production of any quantity of custom matrix trays and low temperature handling trays for SMT components. Utilizing the latest in machining and additive manufacturing technologies,QWIKTRAY will develop a custom pocket design matched to your component specifications and machine it into a finished matrix tray. QWIKTRAYs can be designed for almost any component, including: QFP, BGA, Hybrid, Assemblies, Sockets, Pins, Connectors, LEDs, Switches, Buttons, Transformers, and more! EachQWIKTRAY is CNC machined to the specific configuration for your component and ships ready to load & install in the equipment. The custom matrix trays fromQWIKTRAY are designed for precision, stability, and protection during the pick-and-place process. The ezLOAD system features active grip technology to securely hold boards during the assembly process. It protects components while allowing the boards to move freely through the assembly line. With the basic universal design, there are no mechanical functions to fail on the ezLOAD system. It requires no air, electronics, or communication from the user. The magnetic locking base enables a quick and easy installation. Other base designs are available for machines that feature non-magnetic tables. The ezLOAD system is extremely durable thanks to the soft, flexible design, and is proven to be reliable after testing in the most hazardous conditions. If a support pad becomes damaged or worn, you can just pull it off and replace it. Most importantly, the ezLOAD PCB Support System is affordable compared to competitive products on the market.